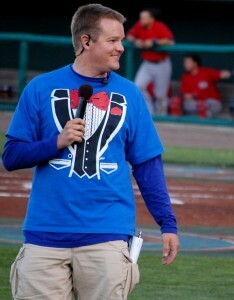 That's my sharp-dressed boss, Ben Hemmen. Yesterday I walked you through what I do when I get to the stadium, up until the game starts. Here’s the rest. Hopefully by the time our Kid of the Game is finished taking the lineup card to the umpires, we’ve got our own lineup card filled out with a great crop of contestants. 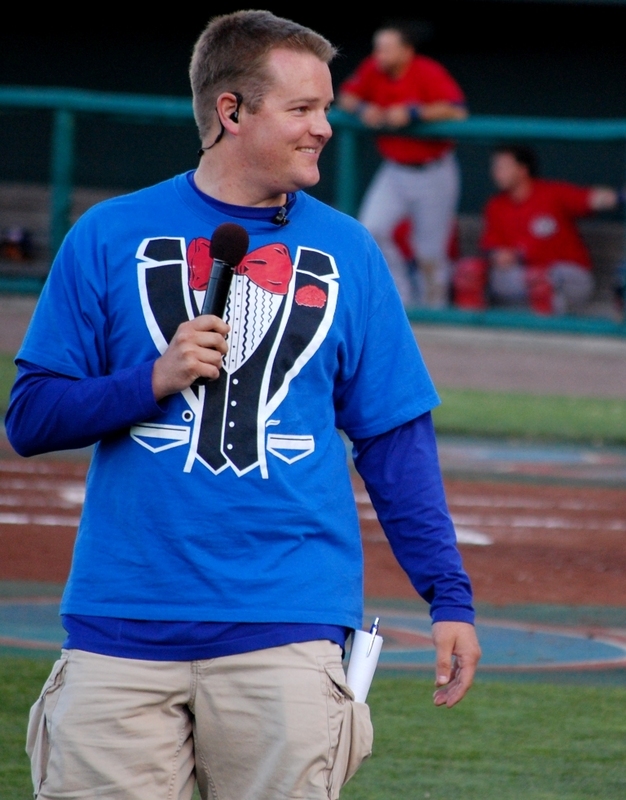 Assuming we filled all the promotions, we give a list of contestants’ names to Ben, our on-field emcee (and boss). 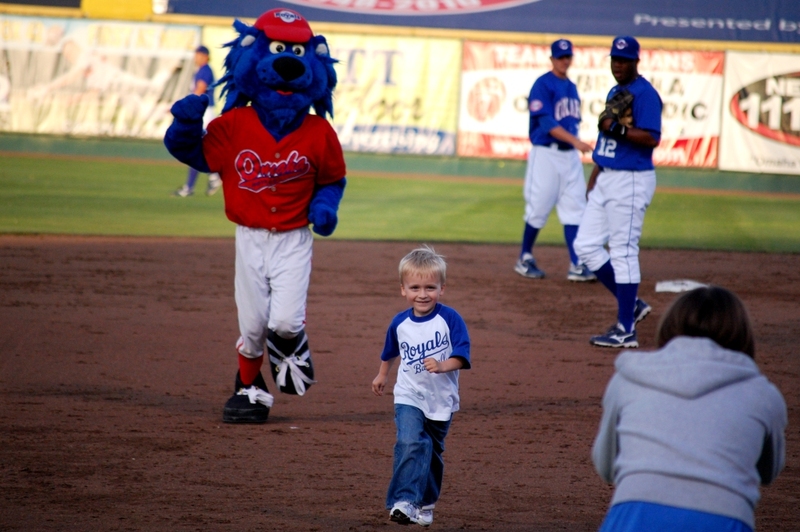 If there is a “field of dreams” team – Little League players who stand on the field with the Royals during the National Anthem – we might help corral them into the 3rd base camera well and back toward their seats. Otherwise, these moments are an opportunity to double-check that we have all our stuff, get some seeds and water, or just relax for a bit. Once the game starts, contestants start trickling in for the between-innings contests they signed up for. Everyone is instructed to arrive in the camera well one full inning – six outs – before their promotion, so that even if there’s a lightning-quick inning, everyone is still ready to go. It can get awfully stressful if contestants are late, or just flake out on us. One time a few seasons ago, a guy regretted signing up for the beer/steak/corn race, and rather than telling us he no longer wanted to do it, he hid in the bathroom until it was over. Please don’t do that! Bean bag toss – two families compete against each other to see who can throw the most bean bags on to a tarp. One family is on 1st base; the other is on 3rd. The winning family gets a prize package for themselves, and whatever side they were sitting on gets softee baseballs thrown to them. Beer/Steak/Corn race – Three contestants race from the left field foul pole to the 3rd base coach’s box, and they’re dressed as a beer, a steak and an ear of corn. This one is way more fun if all three contestants know each other, so I always look for groups of people who look like the fun-loving type. Dizzy Bat race – Two contestants, one on each side of the field, spin around on bats while Ben counts (slowly!) to 10. Then they try to run up and down the baseline. We have two sponsors for this and, ironically, both offer free food items to the winner, who usually needs a moment to collect him/herself after the race is over. A couple popping balloon Number Two. Balloon Bust – a longtime favorite of ORoyals staff! Two couples race against each other to see who can pop 3 balloons the fastest. It works like a grade school relay race: The women run back and forth grabbing balloons and run back to the gentlemen to pop each one in a different way. For the first one, they hug and pop the balloon between them. Then the fellows sit down on chairs and the ladies pop the 2nd balloon on their laps. The last one is the most fun – the men lie down on the ground, and the women bodyslam them. It never gets old. If your wife/girlfriend REALLY doesn’t want to do this contest, she should wear a dress, skirt or tube top to the game and we will refrain from even asking. This is family-friendly entertainment, after all. Rock On – A karaoke battle between first base fans and third base fans. Each side gets a turn to sing louder and longer than the other. A clip of a rock song will play for about 10 seconds, and then the music drops out. The crowd has to carry the song as loudly and for as long as they can, and whichever side rocks harder gets t-shirts thrown to them. Giant Diamond roll – One lucky contestant gets to hang out in the press box for one inning, then roll two giant foam cubes down the net behind home plate. If both of these “diamonds” land with a special “$100” sticker facing up, the contestant wins a $100 gift card from the sponsor. Hurl the Pearl – this is not like the other contests, because everyone in the stadium can “play.” Prior to the game, interns sell specially marked Softee baseballs outside the stadium, the proceeds from which go to charity. During the game – roughly the middle of the 4th – a front office staff member drives a pickup truck around the warning track, and fans try to toss their baseballs into the truck’s sun roof. What that means for promotions staff is, we have to clean up all the missed shots! And of course, many errant shots end up in the dugout in the hands of mischievous Royals players. Those get thrown at us routinely. Jordan Parraz, Irving Falu and Mike Moustakas seem to be the ones to do it most often. I wish more fans would just make the shot, both so they’d be eligible for sweet prizes and Moose would not have a free shot at me in an ongoing “throwing stuff at each other” war. Recycle Bank Toss – teams of two try to throw beach balls into large recycling containers. It basically works like beer pong, but on a large scale and with only 3 “cups.” We only do this contest on Thirsty Thursdays. 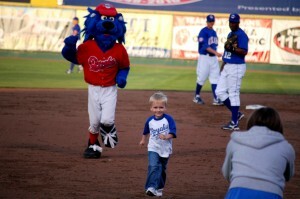 Mascot race – One adorable tiny child races against Casey, the mascot, from first base to third base. It’s always suuuper-cute. Ice Cream or Pie? – One lucky kid gets to choose between taking a free ice cream treat, or shoving a whipped-cream pie into their mom or dad’s face. The crowd gets to help with the decision. You can imagine what they always end up choosing…. Pop-Up – A contestant gets to try to catch some softballs in the outfield, but instead of a glove, they have to catch the three softballs with a fishing net. More catches = more prizes. This is typically just a Friday night thing, after the game but before fireworks. After games, we might help hand out free stuff, depending on how the team did. (More hits/runs = more freebies!) After that we just pack up all our stuff and take it back to the promo room, where it sits ready for the next game. On deck: Part III of the series, which will deal with other random duties, like dancing and such. This is so spectacularly minor league and I love it.